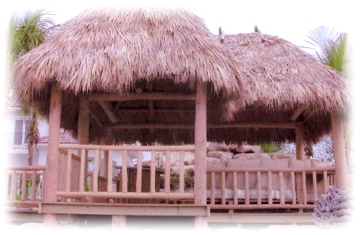 HOME | GALLERY | PROJECTS | VIDEOS | CONTACT US | ORDER YOUR TIKI HUT NOW! Welcome to Tiki Huts & Bars! The outdoors, entertaining guests and having fun. Now you can afford to have them all! In these stressful times where there is hardly time to get out and enjoy the highlights of nature, there is an effective way to lift ones spirit. Tiki Huts! You don’t need to venture too far from home to enjoy the benefits of outdoor living. All you have to do is walk out your door and into your yard or pool and step into Tiki Hut fashion. Imagine bringing out your surroundings by creating a tropical atmosphere right on your backyard. This is where we come in to create your own outdoor living room. Carving out time and creating sophisticated spaces with our custom-made Bars, Tiki Huts, Umbrellas, and furniture. Our clients request accommodations to their outdoor space into a more enjoyable living area to share with friends and loved ones. We bring out an outdoor environment that integrate their active lifestyle with their desire for privacy which gives character and value to their homes. Year-round you’ll be able to welcome and entertain your family and friends into your very own personal tropical paradise. What better way than to have them gather around a beautiful bar with a thatch roof. Breathing in the fresh welcoming air of the outdoors gathering around a beautiful bar. A place to chat, laugh and enjoy each other’s company. Having your favorite drinks and games there. You’ll be the envy of the neighborhood! 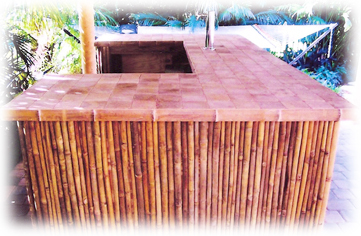 Each Bar or Tiki Hut, Umbrella, etc, can be personalized to the individual’s taste. We promise durability and guarantee of our work. Using the highest natural wood quality materials and reinforcements to the most extreme wind conditions. We also repair any kind of problems you might be facing with your bar or Tiki Hut, or furniture. Enjoy our gallery and contact us today for an estimate.